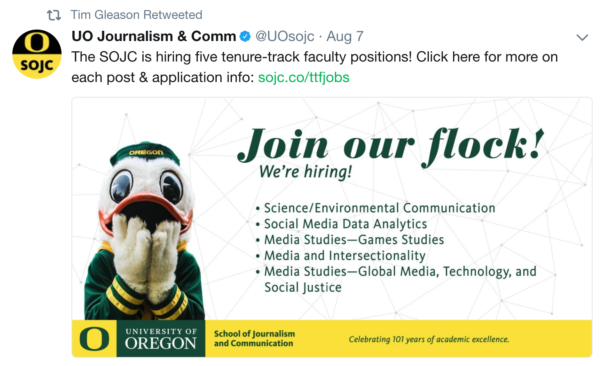 Wait–this was SOJC’s idea? And Tim Gleason retweeted it? Aren’t these people supposed to be media-savvy? Actually, it may be very telling. The progressive social justice warriors meet the progressive corporate world at the progressive corporate university. Look at the topics: enviro, social media, games, intersectionality, social justice. Even the clueless Republicans have caught on.That big goofy duck may look dumb to some of us, but I’ll bet they get plenty of attention. Yup, there’s a reason they call it Schrodinger’s cat, not his duck. Or maybe there’s not. they’ve just figured out hiring poor performing faculty is the best response to fixed merit pools by department. Congratulations, you win the UO Matters second order effect comment of the week. Once upon a time the UO hired beginners on the promise of accomplishment. It is widely appreciated that George Streisinger, hired here into his first academic position, would have been a serious contender (and, in my opinion, a sure winner) for a Nobel Prize had he not died at an early age from a heart attack. He was also a winner (1965) of the UO’s Ersted award for teaching excellence. He was attracted here by the prospect of teaching undergraduates on a liberal arts campus and in conducting research on problems of his choice. I doubt that he ever attended a football game. opaque processing facility of today. In addition, the newly established IMB was pretty unique in the country and so UO was a unique place to go. Now the UO seems unique in more undesirable ways.